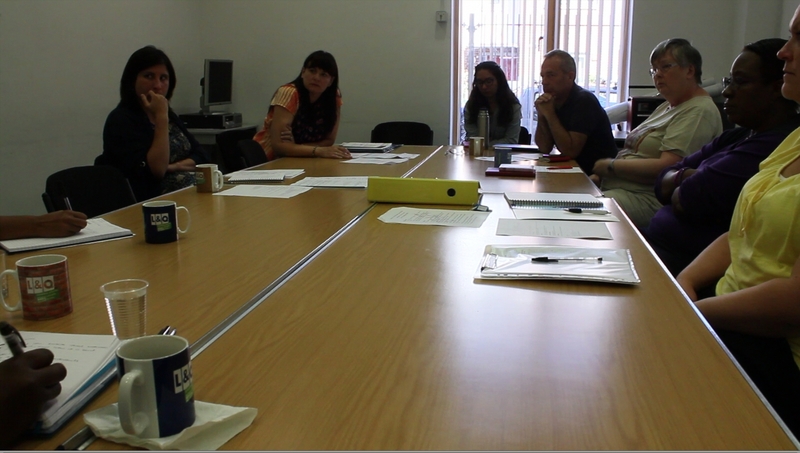 Meeting between community steering group members and L&Q staff, chaired by Southwark Councillor Anood Al-Samerai (left). L&Q staff asked not to be filmed or photographed. Major “Registered Social Landlord” of Silwood Estate (SE16), London & Quadrant’s ‘Media Centre’ have published a report on the re-launch of the Silwood Estate Under 5s playgroup, which omits many aspects of the story that we considered crucial to our report last week. L&Q’s alternative report portrays the company as having played a large part in saving the playgroup, neglecting to mention the eight month battle Silwood residents faced to secure the £11,500 of funding they have finally received, which is a one-off grant not expected to be renewed next year. Nor do L&Q mention that many believe the funding, and far more money, belong rightfully to the community, who were promised the Lewington Centre to replace their previous community building as a condition of the estates redevelopment, which began in the early 2000s. At a meeting between L&Q staff and community steering group members last week, L&Q’s long-standing obligation to hand the building over to the community was reiterated by Southwark Councillor and leader of the Southwark Liberal Democrat group Anood Al-Samerai – who reminded those present that the centre should ultimately be run by a committee comprising predominantly local people working with a minority of L&Q representatives. Alarmingly, this was met with apparent confusion from L&Q staff, who, under their Section 106 obligations, are supposed to have been working towards this goal since the centre opened in 2009, if not before. Among a slew of now-broken promises, Silwood residents were led to believe they would have at least priority access to the building, which in actuality was made unviable as a venue for many community events by apartments being built above the main hall. Large parts of the building are also regularly leased to a local college, making them unavailable to the community. As we reported, and L&Q failed to mention, money collected from the Lewington Centre flats each week was meant to be set aside for the community, to make up for the restrictions they impose on using the building. By the same logic, profit made on renting the space should be shared with the community, who are, after all, supposed to manage the building. Instead of mentioning these things, L&Q appear to be trying to use the re-launch of the playgroup to promote themselves. They boast that, “Children and families in and around the Silwood Estate, Southwark, are celebrating the re-launch of their local playgroup thanks to the work of the Silwood Community Steering Group and an £11,500 grant from L&Q housing association.” They go on to describe themselves in favourable terms, as, “One of the largest housing associations in the capital,” owning “70,000 homes across London and the South East as well as being a leading residential developer of new and affordable homes.” The PR department seem oblivious to the fact that, given London property prices, £11,500 for a company that owns 70,000 houses doesn’t come across as an especially generous sum. Karen Westbrook, Resident Services Manager for L&Q, concludes the ‘Media Centre’ article, saying, “Helping the Silwood Community Steering Group to re-launch a playgroup service was a great opportunity for us to step in and support the nearby community and L&Q residents of the Silwood estate.” This is an interesting take on what many would consider to be a story of community disempowerment, in which a resource has been effectively taken away from residents and then reluctantly lent back to them by L&Q after a long campaign and apparently in exchange for undeserved good PR. Or visit PlanA our general blog on urbanism, planning and architecture. 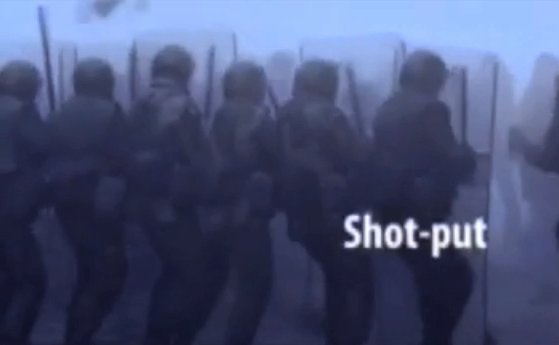 See our Silwood Video Group project pages for more information and videos. Support our work by ordering Silwood related books, maps, dvds and prints from Spectacle’s shop. 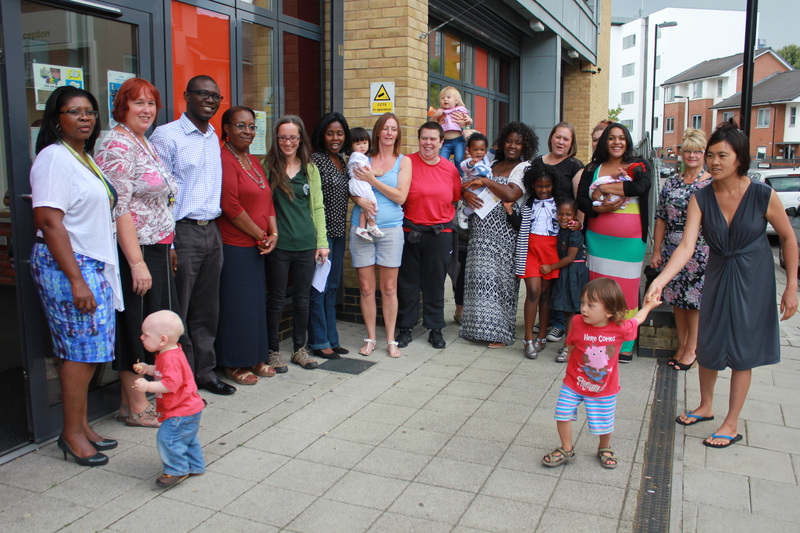 The Silwood Estate Under 5s playgroup reopened today, eight months after it closed. The playgroup, which is held in the purpose-built Lewington Community Centre on the Silwood Estate in Rotherhithe, was shut down in November when Lewisham Council withdrew funding. Since then a number of community members have been fighting to save the playgroup and have finally secured £11,500 towards wages from London and Quadrant (L&Q), who own the building. Although the playgroup reopening is extremely good news, securing the funding is a small victory for the Silwood Estate community in what is likely to be an ongoing battle with L&Q. Residents have been struggling to stake their claim on the Lewington building, and the profit it generates, since it opened five years ago. Before 2006 (when construction work began), L&Q said they would replace an existing, community managed building with a better, purpose built community centre in order to incentivise local support for their proposed redevelopment of the estate. Consequently, the Lewington Centre was built under a section 106 planning gain agreement, which gives a developer favourable terms (in this case free land) but stipulates that they must compensates the community in return. Despite promises from L&Q, the community have struggled with both the suitability of the Lewington Centre and accessing the space – which is controlled by an L&Q manager, not the local community. To start with, Tower Homes, the commercial wing of L&Q, built “affordable” flats for “key workers” (e.g. nurses, teachers, police officers) on top of the centre, making the building unsuitable for evening social events, even after expensive sound-proofing work. To soften this blow, Tower Homes promised tenants that £25 would be collected from each flat each week to put towards community activities. When this money didn’t materialise, L&Q claimed they had put it aside, ring-fenced for community development, before forgetting about it. L&Q have also made the building largely inaccessible to residents by renting almost the entire centre to the Bede Education Trust, a subsidiary of Morley College, and have not donated the money from this to the community either. 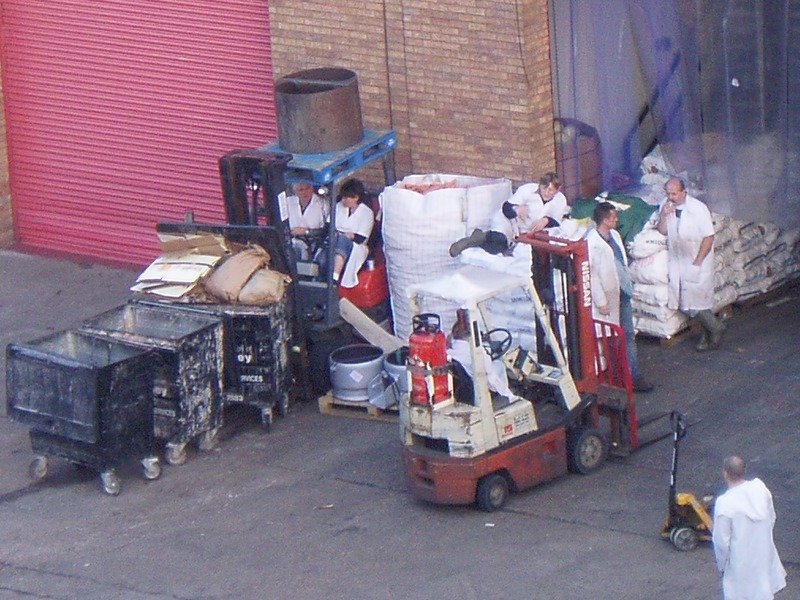 L&Q’s accounts suggest that they are making a yearly profit of between £30,000 and £60,000 from the building. 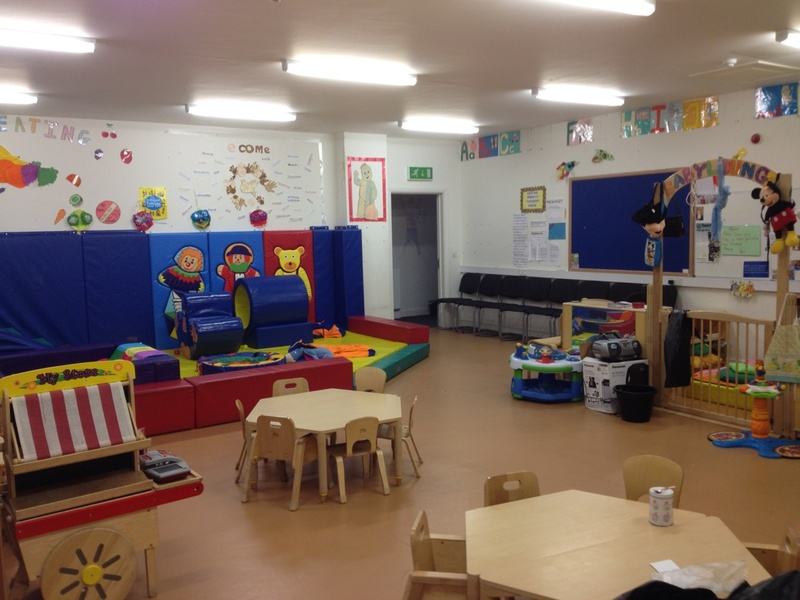 When this is considered, securing space and funding for the playgroup seems like little more than prising a single finger loose from the vice-like grip L&Q have on the centre and its profits. Silwood’s residents are delighted to have a place to go with their children again, which is outside their homes and provides an opportunity to meet other parents. But many still hope that L&Q will go further towards honouring the spirit of their original promise, to provide a better replacement for a centre that was entirely community run, and from which only the community profited. Back in 1999-2006 residents of the Silwood Estate, Rotherhithe, were repeatedly promised by Lewisham Council and London & Quadrant (L&Q) that when the estate was “regenerated” their existing and community managed community centre and other facilities would be replaced with a better, purpose built, community centre- later called the Lewington Centre. The Lewington Centre was built under a section 106 planning gain agreement whereby a developer who is given very favourable terms ( in this case free land ) “compensates” the community. This was already a form of double dipping as Section 106 implies the community is getting something new- not replacing what they have lost. About 4 years ago, the Lewington Centre opened. From the outset the building was clearly not fit for purpose. The “owner” Tower Homes ( the commercial wing of London & Quadrant ) had insisted on building “affordable” flats for “key workers” (e,g, nurses, teachers) on top of the centre. Which, even after expensive re-working of the acoustics and sound proofing, still make the hall unusable for evening social events. Many key workers work night shifts too. Tower Homes sweetened the greedy inclusion of 25 flats by promising tenants that £25.00 per flat per week would go towards funding the community activities. This has not happened. Under the Section 106 agreement L&Q must submit publicly available full accounts for the centre every September- they have not done this and we have only been able to access them via a Freedom of Information request. Three years ago L&Q’s own accounts were showing the Lewington Centre was generating a carry forward profit of £120,000. A few years back at what turned out to be the last Community Forum convened by L&Q Paul Nehra, L&Q’s “Community Investment Manager” promised that the money was ring fenced for investment into the centre. When pushed on why this never happened L&Q claimed though they did collect the £25 p.w. from their hard pressed tenants they “forgot” to pass it on it to the community. Now the profit has “disappeared” completely. One of the services was a playgroup for parents to bring their under 5s. As opposed to sitting at home this was the place to go take their kids and meet other people . However, the playgroup for under 5s has now closed, because suddenly Lewisham Council were going to stop funding the workers. 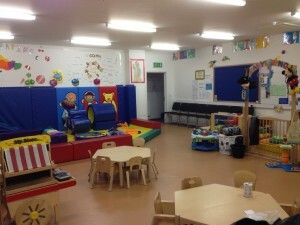 The playgroup was there before the regeneration and it was used by people of the community. It is something that has always been funded by Lewisham Council. Residents feel it was just another thing being taken away from them. This is an ongoing problem for the tenants association as well, trying to get people involved, they cannot afford to pay the rent being charged by L&Q for the room that was purpose built to accommodate them. Allegedly in breach of their Section 106 agreement L&Q has now sub-let almost the entire centre to the Bede Education Trust, a subsidiary of Morley College. “The college in the Community Centre also takes up a lot of time and a lot of space. It was built as a Community Centre, not as a college. Therefore some of the things the College are doing, doesn’t fit in. They closed off half of the hall.” adds Doreen. Recently there have been meetings with residents, centre users and L&Q to discuss the problems but this has been pushed along by Southwark council and tenacious individuals like Christine Oettinger. L&Q say there is going to be a revamp on the finances, so the whole Lewington Centre is not necessarily going to close. There is still hope to get the Under5s Playgroup open again as well. But so far the L&Q response has been to drag its feet and, as ever, offer empty promises. On the Silwood Estate local residents have lost a vital community life through the physical regeneration of the estate. A community that used to run and manage their own facilities has, in Spectacle’s opinion, been systematically dis-empowered. We wonder how things are at other L&Q run community facilities. Anyone know? On Monday 16th of April, a coalition of environmental and human rights groups are unveiling a new online campaign, Greenwash Gold 2012, focusing on the ‘worst’ London Olympic sponsors. this is sure to ramp up the pressure on LOCOG after the fiasco surrounding Dow Chemical’s sponsorship of the London Games as further groups look set to unite in opposition to various London Games sponsors. 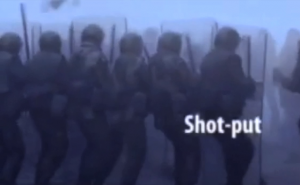 Three controversial Olympic sponsors, Dow Chemicals, BP and Rio Tinto are the targets of the new online campaign. Each has been made the subject of a short animated film (by various award-winning animators) and viewers will be encouraged to visit the ‘GreenwashGold’ website where they will be able to vote for the worst corporate sponsor. During the Games, in July, the organisers will award medals to these companies based on the results of the public voting. A survivor of the Bhopal disaster who witnessed first-hand the devastation caused by the gas leak and campaigns tirelessly to highlight Dow Chemical’s liability towards the ongoing chemical contamination. A representative from the Gulf Coast where communities are still dealing with the environmental devastation of BP’s catastrophic oil spill. An organiser with indigenous communities in Canada fighting BP’s controversial tar sands operations. A mother from Utah fighting against the life-threatening air pollution levels caused by one of the mines from which Rio Tinto is providing the metal for the Olympic metals. A community representative from Mongolia where another Rio Tinto mine proving medals metal is accused of exploiting scarce water resources in a desert region. The launch on the 16th will be chaired by Meredith Alexander, the ex Olympics ‘ethics tsar’ who resigned her role on, the Commission for a Sustainable London 2012, over controversies surrounding Olympic sponsorship. 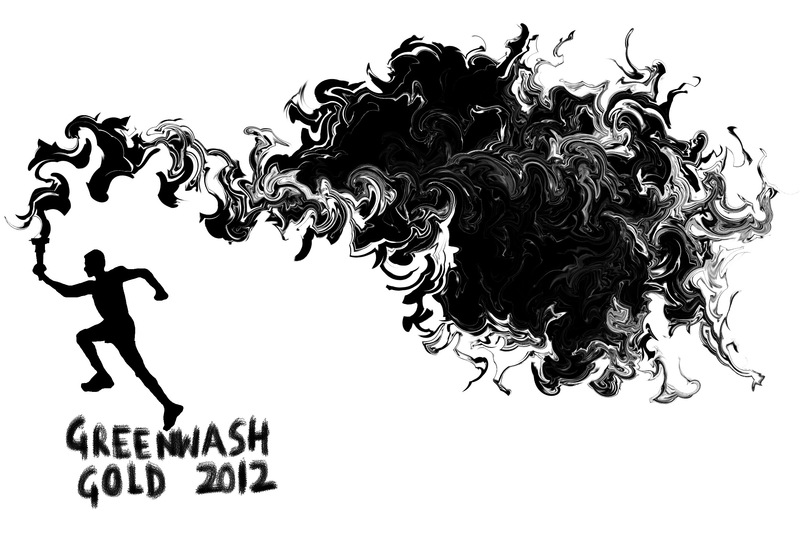 GreenwashGold website goes live with animations from 16th April. Colin Toogood has worked for the BMA for three and a half years after a change of life decision for this erstwhile DJ. Colin decided he needed something more worthwhile to do with his time and feels very lucky to have found such a worthwhile cause to be working for. Cherise Udell, the founder of Utah Moms for Clean Air, is a mother of two, and a resident of Salt Lake City. Cherise has a B.A. in Cultural Anthropology from U.C. Berkeley and is nearly finished with her M.S. in Environmental Health and Social Ecology at Yale University. Zanaa Jurmed is the Director of the Center for Citizens’ Alliance and Vice Chair of the Tripartite National Committee on Resolving disputes mining and public property issues. She is also the Chair of the Board of the Oyu Tolgoi Watch, a non governmental organization in Mongolia. She is the founding member of the number of Women’s and Human Rights NGOs since 1992, member of the Human Rights group to the Mongolia President and non-staff member of the Mongolian National Human Right Commission. Derrick Evans is a sixth-generation native of Turkey Creek, a Mississippi Gulf Coast community settled by freed slaves in 1866. Derrick founded Turkey Creek Community Initiatives to promote sustainable local development that is both environmentally and culturally sensitive. Since Hurricane Katrina and the devastating BP Deepwater Horizon spill he has been a tireless organizer and advocate for the needs and rights of coastal communities, and is an advisor to the Gulf Coast Fund. Clayton Thomas-Muller, of the Mathias Colomb Cree Nation also known as Pukatawagan in Northern Manitoba, Canada, is an activist for Indigenous rights and environmental justice. Clayton is the tar sands campaign organizer for the Indigenous Environmental Network and works with grassroots indigenous communities to defend against the sprawling infrastructure that includes pipelines, refineries and extraction associated with the tar sands, the largest and most destructive industrial development in the history of mankind. See our Olympics project pages for more information and videos. A group of 40 businesses located near the Olympic Park are filing lawsuits against the London Organising Committee of the Olympic Games (LOCOG), on the grounds that the companies do not receive sufficient compensation when their businesses are devastated by the road closures or other relevant measures. These companies fall outside the LOCOG’s compulsory purchase zone, ranging from transport business, cafes, garages to retailers, have committed a small amount of money to take legal action against LOCOG over the alleged lack of compensation plan and a perceived failure to provide relocation packages for the worst affected. Lawyers from John Halford and Paul Ridge will advise the group for a moot action against LOCOG. LOCOG claimed Olympics has the capacity to transform one of the most underdeveloped areas of the country for generations to come. But businesses warned that having fewer customers is the only Olympic legacy they have. The government’s plan to ‘regenerate’ the area will result in relocation, such moves may also pull away some loyal customers. From a community blog “Newham 2012“, a local pub owner faces an uncertain future due to radical changes within the community, he told the blogger that it was packed two years ago, but now there were only 3 other people in the pub. The Federation of Small Businesses (FSB) said a study of nearly 1,700 small firms indicated that only 7% of them believe the 2012 Olympics will be of benefit to them. And 25% said they thought the events would have a negative impact. In this case, the bill for hosting London Olympics keeps rising, the economic impact is now going beyond what the Prime Minister David Cameron defended earlier for £9.3 billion. At this point, we can say the perceived “Olympics Effect” has almost vanished (the term refers to the fact that the West End predicts more than £17million being spent in major shopping districts or other economic benefits driven by tourism), some companies forecast the Olympics will flush in large amounts of income, pushing cafes and shops to rebrand themselves as “Olympic” in East London. The imminent Olympics will take place in a city still recovering from the riots. Seven months ago we were shocked by the images that dominated our television screens. 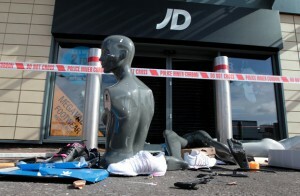 The riots, in which around 15,000 people took part, were characterized by the looting of designer stores, such as Footlocker, JD Sports, Orange, O2 and Adidas. Roughly 50 per cent of the recorded offences from the riots were acquisitive in nature. The Riots, Communities and Victims Panel, established by the Prime Minister, Deputy Prime Minister and the Leader of the Official Opposition, this week published a report documenting the panel’s findings and recommendations to help prevent future riots. Rampant materialism is considered an underlying cause of last year’s lawlessness. In addition to the lack of economic opportunities, a breakdown of community ties and the loss of trust in the police and public sector, the panel considered aggressive advertising of designer brands a key cause of last year’s rioting. Aggressive marketing and enforcement of branding creates a demand for objects that low-income sectors of the society simply cannot afford. Big businesses, targeting children and young adults, have created a damaging consumerist culture in some of the most deprived parts of the country. In fact, the panel’s Neighbourhood Survey found that 85 per cent of people feel advertising puts pressure on young people to own the latest products and two-thirds of people feel materialism among young people is a problem within their local area. Yet, aggressive advertising is a big feature of the Olympics (the LOGOC* have their very own report entitled Brand Protection) and ambush marketing (the association and consequent capitalization on a particular event without paying sponsorship fees) is one of the London Organising Committee of the Olympic Games’s major concerns. In addition to the concentration of world-famous sporting personalities, the Olympics has now become an effective publicity platform for the advertisement of a plethora of objects, many of which are completely unrelated to sports. In an attempt to keep up with a world rebuilt in a corporate image, the Games have secured sponsorship deals domestic and abroad, ironically culminating in a £20m-plus sponsorship deal with Cadbury. In light of the UK’s childhood obesity problem, some argue that a sweet brand should not promote a sporting event. The Games now embody changes in our society that are incredibly remote from their notional or founding ideals. Increasingly obsessed with the global gaze and the prestige that hosting the Olympics will achieve within the media, the games are keen to promote big brands, and discourage (if necessary by using force) smaller brands that challenge the hegemony of prime corporate sponsors (including MacDonald’s, Visa and Dow Chemical). This will undoubtedly translate into hours of sponsor-related TV ads plaguing our television screens during the summer months and the city of London being literally branded by these bigger brands. In a city agitated by record levels of unemployment and rising social protests, the continual bombardment on the TV screen by designer brands of over-priced products, which will now be rendered all the more desirable and unaffordable by the Olympics logo stamped on the side, is surely not a good thing. 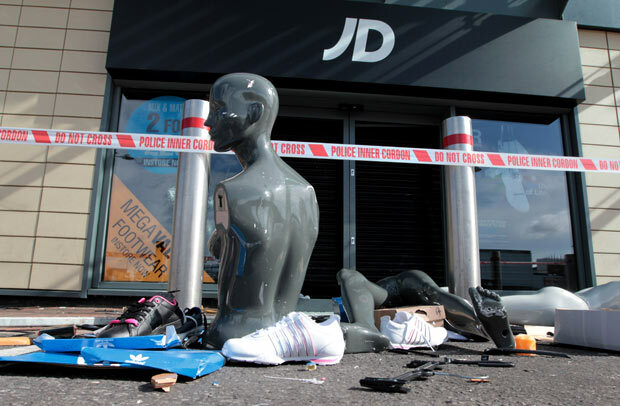 The Riots, Communities and Victims Panel’s recommendation that steps need to be taken to reduce the amount of excessive and aggressive advertising aimed at young people should perhaps, in the essence of social responsibility, be listened to sooner, rather than later. Ambush marketing is something that is causing much concern to the London Organising Committee of the Olympic Games (LOCOG). It is an issue that has already been causing panic, with numerous reports of alleged ambush marketers coming to light in the last few years, and LOCOG fear that it will become even more intense in the coming months as we get closer to the start of the games. However, if you are wondering what ambush marketing is exactly, let me explain. The International Olympic Committee (IOC) defined it as “all intentional and unintentional attempts to create a false or unauthorised commercial association with the Olympic Movements or the Olympic Games”, which is a fairly selfish definition on their part. Honda has been under investigation by LOCOG following the release of a 2011 ad campaign which featured numerous British Olympic athletes. Furthermore, BMW are the official car sponsor of the Olympics. However, the IOC’s definition also seems to include small businesses who could be seen as trying to rival McDonald’s, Coca Cola and Visa, who are also official sponsors of the Olympics. The official sponsors have paid almost unimaginable amounts of money to be associated with the mega event, and they are most keen to protect their investment against all ‘rivals’ trying to associate themselves with the Olympics for free. Small businesses could also be potentially fined up to £20,000 without even realising that any crime had been committed, with LOCOG taking a zero tolerance approach on all ambushers. Surely, with big multinational corporations putting small companies out of business all over the world, LOCOG’s wrath should only be directed at the multinationals, but at least McDonald’s will be safe from the threat caused by small businesses. The spectators at the Olympics this summer are also not safe and could potentially be turned away, or have items taken away from them if they are not products of the official sponsors. At the 2006 football World Cup in Germany before the start of a match, some spectators “were forced to watch the game in their underwear after being forced to remove their orange lederhosen linked to a ambusher brewer”, possibly a sign of things to come. But now that the Olympics has become an advertisement for products that have no connection to sport, and that the world is being rebuilt in a corporate image, and we now no longer have the right to even wear our own clothes, everything is now falling in to place for this years Games to be the most successful yet. The 70,000 London 2012 Olympic Games volunteers have been told that they are banned from posting about the games on social media sites. The London Organising Committee of the Olympic Games (LOCOG) have released a document detailing what volunteers can and can not say. In the document volunteers have been asked not to mention details about their role, their location or about the athletes. However, this does seem to contradict British Olympic Association Chief Executive Andy Hunt’s statement that “The International Olympic Committee themselves are really pushing the use of social media and we support that“. Jean Tomlin (LOCOG HR Director), who blogged in 2011 on the London 2012 website, said that the “Volunteers are the lifeblood of London 2012”. It certainly seems apparent that without the help and the passion of the volunteers, who are giving up their free time to ensure the success of the games, the London Olympics would not be possible. However, with such an infringement on civil liberties LOCOG certainly seem more than willing to dig a yet deeper hole for themselves. As initial offers for the volunteering roles during the 2012 Olympics are sent out this week, some successful 10,000 Game Makers have two weeks to accept them. McDonald’s anticipates the replies particularly impatiently, because the fast-food giant is in charge of providing training for the volunteers. 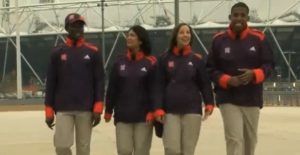 However, it is just the beginning of a long process of filling up all of the 70,000 unpaid positions for the Olympics. Over the next few months thousands of e-mails will be sent to applicants, aiming to inform everyone about the progress of their application by the end of this year. LOCOG officials also claim the last interviews are scheduled for March, 2012 and the last role may be taken even as late as April, 2012. All candidates have to undergo security checks before signing the final contract. The first volunteers who received conditional offers are inter alia: Nader Mozakka from North West London who will be an NOC Assistant in the Athletes’ Village; Maggie Hendry from Dundee, Scotland who will be a Physiotherapist at North Greenwich Arena at Games time; Erin Morgan from Newry, Northern Ireland who will be an Event Services Team Member at the Olympic Park and Charlotte Evans from Caerleon, Wales who has been assigned a role as an Event Services Team Member for Wimbledon. The “McJobs” offered are perhaps not the world’s most desirable employment, although initially promised to be financially rewarding, will be unpaid for the 2012 Olympics. Spectacle has already covered McJobs, which can be found in the Olympics 2012 section of Spectacle’s Blog. 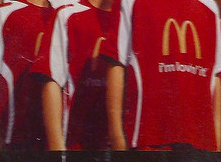 Unsurprisingly, the official volunteer t-shirts will not be the only place where golden arches will be seen at the 2012 Olympics, as McDonald’s also obtained a monopoly on food sold during the Games. This has stirred up a debate on public health and well-being, which could be argued as not being on McDonald’s priority list. This American meal brand plans to open the largest McDonald in the world in the Olympic Park, Stratford. It is also interesting to know that there will be no kitchens provided to athletes, who will be forced to dine in the dining halls catered also by McDonald’s. Obviously, McDonald’s sponsorship is happily welcomed by LOCOG, but should their profit really overshadow the Olympic’s overriding goal of promoting a healthy lifestyle? Countless employers are now facing the problem of dealing with twenty three working days without key employees come 2012. The deadline to volunteer for the Olympics is the 27th of October, 2010. The London 2012 Olympics Organising Committee (LOCOG) have stated that 70,000 voluntary positions need to be filled, but more than 100,000 people have already applied. The voluntary roles consist of general and specialised positions, from desk staff, events stewards and drivers. Volunteers must work for a minimum of 10 days for the Games, and 20 for the Paralympic Games. Training is also mandatory for all participants. There are also a further 8000 positions to be filled for the role of “London Ambassadors”, which would involve helping the vastly overstated and questionable increase of tourists and visitors in 2012 find their way around the city. The “workers” will be given Macdonalds meals and bus travel for the day, but are not even allowed free tickets for the events. To read more on this click here, here, and here.